Pima County sound familiar? Jared Loughner killed six people and left 14 injured on the Safeway parking lot on Saturday January 8th last year. This happened in Tucson, in Pima County. U.S. Representative Gabrielle Giffords was one of the injured. Lately Ted has been complaining that he has to follow rules that “nobody knows about” (danger, Glenn Beck link!) You see Nugent just cut a deal for breaking the law while hunting black bears in Alaska (PDF Link to his plea to avoid jail time and $100,000 fine). I’m not a lawyer, but by reading this plea you can see that in exchange for a reduced sentence he is obligated to do certain things. There you have it folks. Nothing to worry about. Of course if anyone sees his security staff, his roadies or Nugent himself carrying weapons at the Fair they should contact Fair Executive Director Jon Baker or Launa Rabago, Marketing Manager 520-762-9100 jon or launa @ PimaCountyFair.com at the Southwestern Fair Commission about his violation of their rules. Maybe they will deduct the cost of his non-compliance from his fee. But you should also contact his parole officer. Since I don’t who it is I’ll suggest you contact Jack S. Schmidt, the Assistant U.S. Attorney who cut the illegal bear hunting deal with Ted. Please send all backstage or onstage videos of Nugent with weapons or threats of violence toward people to jack.schmidt @ usdoj. gov. I don’t think these videos would show him violating his federal agreement, but it might show his violation of his agreement with the Fair people. You see I want Jack to be kept informed about all the other times that Nugent knows the rules and regulations for the activities he engages in, but still violates them. It will be good for the “preponderance of evidence” for the next time Nugent “stumbles” (his euphemism for breaking the law) when it comes to weapons. Jack might also want to read Nugent’s latest post, “Ignorance of the Law is no Excuse.” It’s not his obligatory PSA, so he didn’t have to run it by Schmidt for approval, but doesn’t this article and his appearances on shows like Glenn Beck where he discusses the opposite of what he will say in the PSA mean anything? It’s like addict celebrities doing a “Don’t do drugs” PSA while joking on the Leno Show about all the coke they still do. Will people only watch court mandated PSAs and ignore what Nugent says on nationally syndicated radio shows? When powerful people like Nugent get caught breaking the law or defying the rules that they agreed to, they pay a fine and move on like Nugent did the last time he got caught breaking the law. Question: How many times do you get to break the law before you stop classifying yourself as a law-abiding citizen? “I’m a serial law-breaking citizen and I carry a gun. ” Is the reality for many gun owners, but they don’t want to classify themselves that way. Some will, however, classify other people as law-breaking and suggest they be arrested for doing or saying exactly what they have done or said. Below is Nugent on TV in 2008 with his good friend Sean Hannity saying people on the left who make threats are “reprehensible” he takes threatening comments seriously and believes people should be arrested for them. Ted Nugent gets death threats, takes them seriously, says people who make them should be arrested. Video link. Now, before Ted starts whining about the “lunitic left fringe trying to force him to comply to rules” I just want to state that this prohibiting of weapons at the fair is not coming from the Government. It is coming from the private corporation, the Southwestern Fair Commission, Inc. They have the right to do this. And Nugent and his agents signed a contract that said he would honor their rules. If he doesn’t honor their rules why should anyone else? What is it about breaching signed contracts doesn’t he understand? What Happens When Someone Brings a Gun to the Fair? If someone comes to the Pima County Fair gate and says, “I have a concealed weapon that I’d like to bring into the fair.” The staff can say, no weapons is our policy and ask them to remove the weapon and “place it in the custody of the operator of the establishment or the sponsor of the event for temporary and secure storage of the weapon pursuant to section 13-3102.01”; (link) In practice they usually are told to place them in their vehicle. Since I wanted to know the law about what would happen if Nugent and his non-uniformed security people don’t comply I spoke to Laura Cutilletta, an attorney from the Legal Community Against Violence. It appears that if someone has refused a reasonable request from the fair staff, the staff can call the Pima County Sheriff. What will the the sheriff do? To find out I called Dawn Barkman, the public information officer at the Pima Country Sheriff’s office. She said that if the Fair staff ask the person to comply or leave and they don’t, then the Sheriff’s office would come and arrest the person. 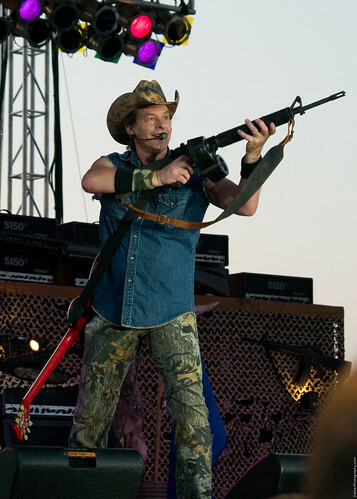 I hope Nugent is willing to surrender his arms like a good, law abiding citizen. And I hope the people running the Pima County Fair are consistent enough to insist he does. This behavior should be noted by Jack S. Schmidt, the Assistant U.S. Attorney. but especially for all the other county fairs and festivals thinking of booking Nugent in the future. What about the Venue’s Rights? When a fair doesn’t book Nugent they are not violating his First Amendment rights. A venue has a right to have policies that say no weapons. By doing so and requiring the entertainer or customers to follow those polices they aren’t violating anyone’s Second Amendment rights, they are asserting their own right to control their venue. Based on what happens at the Pima County Fair other venues can see if Nugent defies their rules, and can decide if he is worth the hassle to book. They also need to understand that fans who attend might not follow their rules either. Yes, they say they are law-abiding, but then again so did Nugent before each of his law breaking events. She said they’ll be in full compliance of the law.